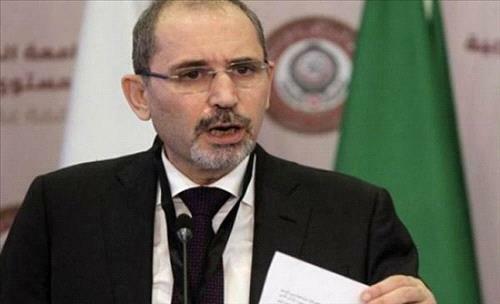 AMMONNEWS - Minister of Foreign and Expatriates Affairs Ayman al-Safadi said the issue of the United Nations Relief and Works Agency for Palestine Refugees in the Near East (UNRWA) is a priority to Jordan. During a Palestine parliamentary committee' meeting on Sunday, Safadi noted that Jordan continues to exert every effort to mobilize international political and financial support to enable it to continue its duties toward more than five million refugees Palestinian as mandated by the United Nations. The meeting, chaired by MP Yahia Sa'ud, was held to discuss the latest developments on the Palestinian issue and the Foreign Ministry's efforts in this regard. The foreign minister added that protecting the UNRWA means respect for the right of refugees to live in dignity and the right of more than 500,000 refugee children to go to schools, in addition to their right to return and compensation, in accordance with the international legitimacy's resolutions. Speaking about the consequences of the US's decision to stop funding for the UNRWA, the minister said the move is regrettable and exacerbates the UN agency's financial challenges and threatens its ability to provide vital services to refugees. He pointed out that while the US announced the cessation of its support for the UNRWA, many countries intensified their financial and political support for the agency, which allowed the opening of schools and the delivery of services. Such support by these countries, the minister added, sends a clear message that the world supports the UNRWA to provide services to the refugees in accordance with its UN mandate. Jordan, he indicated, has exerted intensive efforts to convince the US to maintain its financial support to the agency and work with the international community to reach a formula to ensure a more equitable distribution of support quotas, but Washington made its decision to stop support, which will exacerbate the UNRWA's financial deficit this year. Safadi warned of the grave ramifications of failing to address the UN agency's needs on the humanitarian conditions of the refugees and on security and stability. Denying refugees from the agency's services will deepen the feelings of despair and deprivation and will render tension and instability a real danger, the minister further warned. He emphasized that the Palestinian refugee issue is a final status issue that must be resolved based on international legitimacy resolutions, foremost of which is Resolution 194 and the Arab Peace Initiative, in a way that ensures the refugees' right to return and compensation. Al-Safadi noted that Jordan called for an Arab foreign ministers' meeting on September 11 to discuss ways of supporting the UNRWA. He added that the Kingdom will organize in cooperation with Sweden, Japan, the European Union and Turkey a conference on the sidelines of the UN General Assembly this month to discuss means of securing the necessary funding for the agency and further establishing the political support for its role. Any decline in the agency's services and any attempt to undermine its role threatens to leave serious consequences, especially at a time when there is no prospect of ending the occupation and resolving the conflict on the basis of a two-state solution that guarantees the establishment of an independent Palestinian state with East Jerusalem as its capital, Al-Safadi said. As for brotherly and friendly countries' positions on the matter, Safadi lauded many countries' great role in ensuring financial deficit of UNRWA is filled aw well as supporting its role are as an emphases on all the refugees' political and livelihood rights, while appreciating the positive, clear and frank role of the international community in this regard. Since the beginning of the current year, the minister noted, a total of $200 million has been collected, bringing the agency's deficit down from $417 million to $217 million. MP Sa'ud commended Jordan's diplomacy, under the leadership of His Majesty King Abdullah. "No one can question Jordan's role in defending the Palestinian cause," Sa'ud said, referring to the importance of his Majesty's tours and meetings, which had a clear impact in mobilizing international, political and financial support for the UNRWA.